We introduce to you “Nexus Security Services Pvt Limited” “Since 1994”, licensed under the Private Security Agency (Regulation) Act 2005. We offer specialised services for Uniformed Security guards / Detectives /Outsourcing & Training Academy, which are manned by well-trained, experienced & skilled staff. 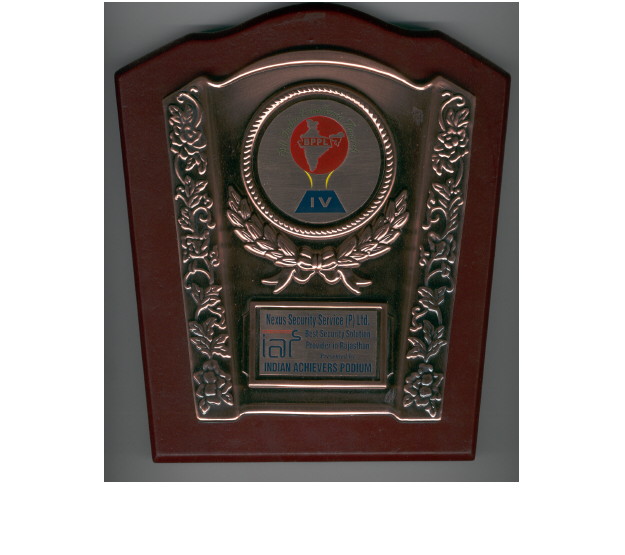 Our’s is a Private Limited Company incorporated under the registrar of Companies Act, 1956. We provide trained and experienced personnel to guard factories, mills, and offices, go downs, residential houses and other establishments. Armed guards (Gun-man) are also provided by us. Trust Nexus, To protect your home and business from any potential threats. We introduce to you “Nexus Security Services Pvt Limited” “Since 1994”, licensed under the Private Security Agency (Regulation) Act 2005. These case studies are true expereince of our network associates and our talented team during the course of various verifications to reveal facts. We are a member of APDI (Association of Private Detectives of India) with a pan India network of around 1000 network associates. We provide complete HR solution with compliance’s of various Govt statutory liabilities of employees outsource through us. We are the pioneer in Rajasthan to establish the Security guards Training academy and to provide “Certificate course” to candidates as per rule…. We render staffing services of allied activities such as Stenos, Clerks, Peons, Typists, Computer Operators, Drivers, loading / unloading & Sales…. 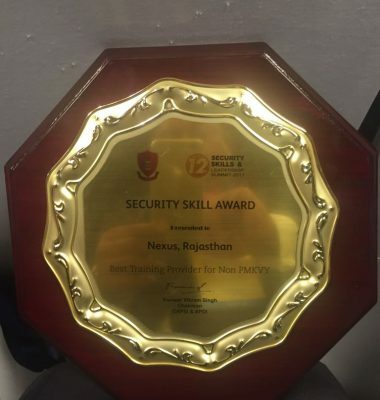 In the year 2010, our Company m/s NEXUS SECURITY SERVICES PVT LTD given the CERTIFICATE OF EXCELLENCE and was recognised as the “BEST SECURITY SOLUTION PROVIDER OF RAJASTHAN” . The conference was held at Deputy speaker hall, Constitution club of India, Rafi Marg, New Delhi. 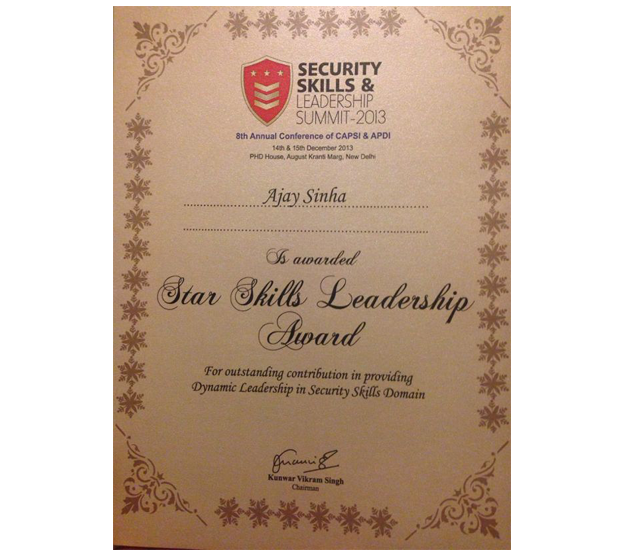 Star Skills Leadership Award Presented to Sh. 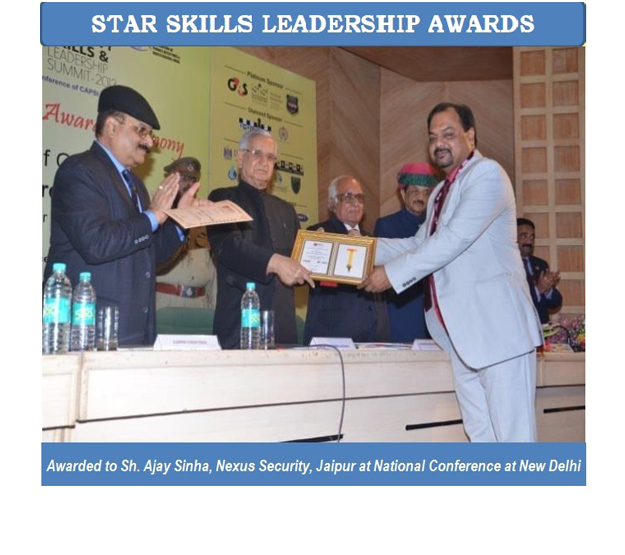 Ajay Sinha, Nexus Security Services Private Limited for outstanding contribution in providing leadership in the security Domain from Security Skill& Leadership summit-2013. We have a comprehensive network of investigators all across the country who are familiar with the local language as well as the topography of these local areas. we also have the resources and expertise to conduct investigations throughout the length and breadth of the country and provide reliable and authentic information. 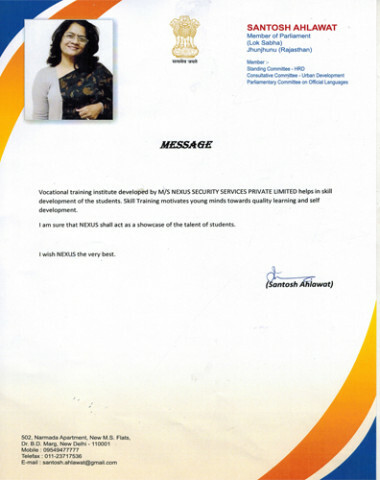 Vocational Training Institute developed by Nexus Security is a milestone achievement of Skill development Training and Placements thereafter in the state of Rajasthan. Our Managing Director , Shri Ajay Sinha being nominated as PRESIDENT OF RAJASTHAN CHAPTER at National conference of APDI held at New Delhi. 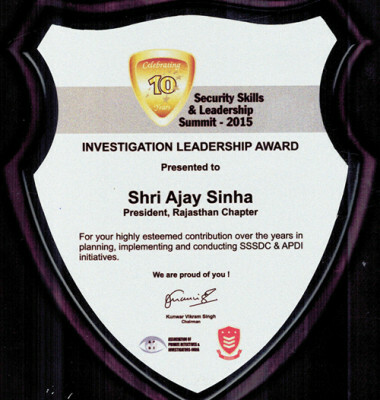 SECURITY SKILLS AWARD 2017 Presented to Sh. 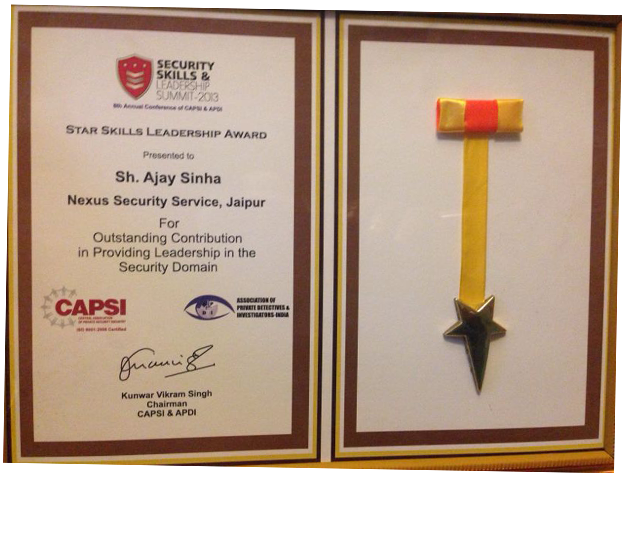 Ajay Sinha, Nexus Security Services Private Limited for outstanding contribution in providing leadership in the security. 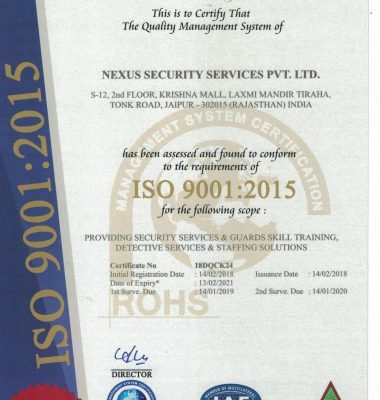 Nexus Security Services Private Limited has been assessed and found to conform to the requirements of ISO 9001: 2015 for the following scope: providing security services & guards skill training, detective services & staffing solutions. Nexus Security Services Private Limited has been assessed and found to conform to the requirements of ISO 9001: 2015 for the following scope: Provision of manpower, payroll & statutory outsourcing. 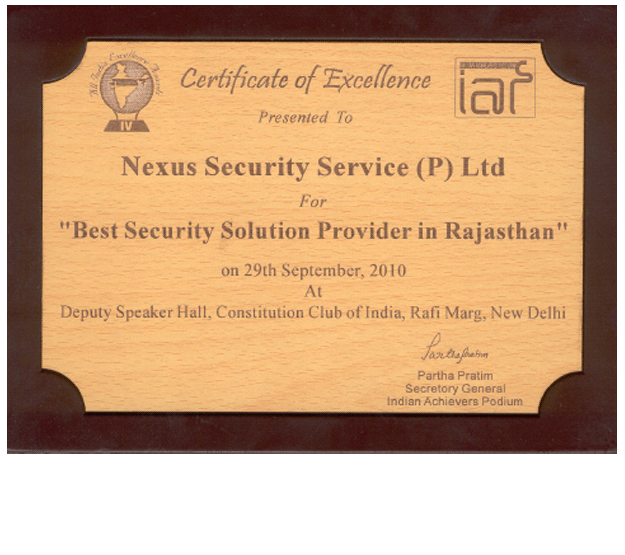 We are indeed very happy that Nexus has been awarded the Best Security Solution Provider in Rajasthan.  We introduce to you "Nexus Security Services Pvt Limited" "Since 1994", licensed under the Private Security Agency (Regulation) Act 2005.Our's is a Private Limited Company incorporated under the registrar of Companies Act, 1956.